MORGANTON, N.C. - Coming soon to a theater near you: Burke County's mysterious Brown Mountain Lights in North Carolina. 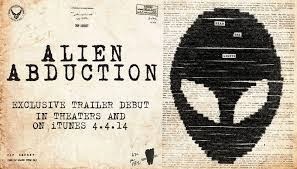 The lights, a mysterious natural phenomenon seen for centuries near their namesake mountain, play an integral role in Alien Abduction, a highly-anticipated sci-fi thriller hitting the big screens April 4, 2014. The independent movie was filmed in Burke, Avery and Watauga counties in NC in 2011, and will hold its world premiere Tuesday, April 1, 2014 at the Marquee Cinemas in downtown Morganton. Director Matty Beckerman and producer Cathy Beckerman, both of Los Angeles, will be on hand for the premiere, and will host a Q-and-A session following the 7:00 p.m. screening. Beckerman grew up on the East Coast and learned about the Brown Mountain Lights as a kid visiting his grandparents' house in Blowing Rock. During those visits he also experienced the remoteness of North Carolina's mountains, and combined those two ideas into a fictitious story that involves the lights and the disappearance of people. "We would often get lost on some of the back roads. I remember sitting in the car and daydreaming about what would happen if we really got lost," Beckerman said. "What would happen if our entire family got lost? That was the inspiration. That's where I started." The movie uses the found-footage format to tell the story from the viewpoint of a family on a camping trip to Brown Mountain. Beckerman describes it as a "psychological thriller" that does not rely on blood and gore to stir emotion. "Sometimes the things you hear affect you more than the things you see," he said. Burke County tourism director Ed Phillips was instrumental in bringing the world premiere to Morganton, and feels it will generate renewed interest in the mysterious lights. "Even though the film is spooky and scary, it will definitely bring attention to the lights. We already have a business in Morganton offering guided tours to try to see the lights," Phillips said. "IFC Films is distributing this worldwide. It's a big deal. I recently read a review that said it's probably the best found-footage film since the genre was created by The Blair Witch Project." The movie also interviews the two people most associated with studying the lights - scientist Dan Caton of Boone and paranormal researcher Joshua Warren of Asheville. "Making this movie in Burke County and being able to debut the film there is a special moment for me," Beckerman said. "I believe people are going to really react to it. People will see this worldwide and it will draw attention to the Brown Mountain Lights. The lights are there; they're real. Anyone can go to see them."